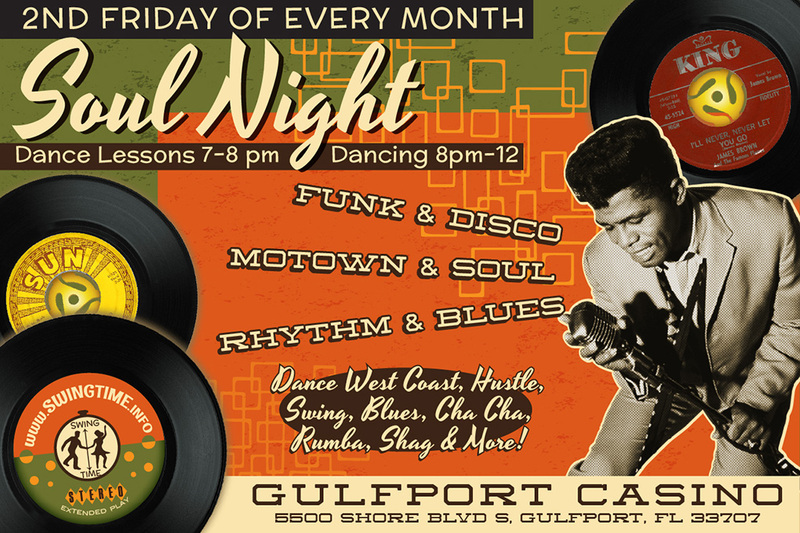 Friday, April 12th (2019) is Soul Night at the Gulfport Casino, happening the second Friday of every month! Dance to the best in Funk, Soul, Disco, Motown, Rhythm & Blues, with an exciting mix of retro and modern dance music, great for a variety of partner dances (Hustle, Swing, West-Coast, Blues, Stepping, Cha Cha, Rumba, Shag, Fusion, etc), plus group, line, and freestyle dancing too! Music & Dancing happens 8pm-midnight, preceded by a Dance Lesson 7-8pm. Just $10 includes the dance AND the lesson. Students get $6 admission if they show up by 7:00pm and take the lesson. Lesson Info — Join special guest instructor, Angie Causey, and the United Soul Line Dancers for a Soul Line Dancing lesson at 7pm. You'll learn three new soul line dances, and you'll get to dance them all later during the dance! Dance instructor & choreographer, Angie Causey, is founder of the United Soul Line Dancers. She's been dancing and teaching for over 10 years, and regularly travels and teaches all across the USA.